Born in Grand Forks in 1908, Crosson moved to Victoria with his father and brother at an early age. He joined a deep sea merchant ship at age 14, visiting Shanghai and Manchuria, then entered King George High School in Vancouver. In 1927 he began working on American freighters. In 1929 he sailed with the Hydrographic Survey ships charting the west coast of Vancouver Island, including a stint on the federal survey ship Pender in the 1930s. In 1936 he became one of the earliest prospectors at Zeballos. There, as an experienced carpenter, he built some of the first mine buildings and a shack for his own use. These structures eventually grew into the townsite of Zeballos. 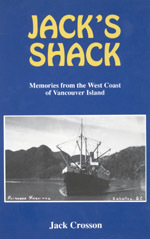 Jack's Shack (Whistle Punk Books, 1990 $12.95) is his account of his adventures on Vancouver Island during the 1930s. In 1939, he left Zeballos as an Army recruit. He spent the war years on merchant ships. He returned briefly to prospecting, bought a fishboat with Red Ponsford, then settled at HMCS Dockyard in Victoria where he was Captain of the Ammunition Lighter and small ferry boats until his retirement in 1972. [BCBW 2003] "Biography" "Local History"